Earlier updoots are rougher on art and writing, though they may get a face-lift. For instance this author note is an edited version. and separately themes like abuse, loss, and suicide are liable to come up despite the positive atmosphere I'm going for. ⚠️ is for suggestive or potentially triggering audio. These will be generally avoided, but if used a spoiler will appear below. a '-!-' will appear when the music is no longer relevant. 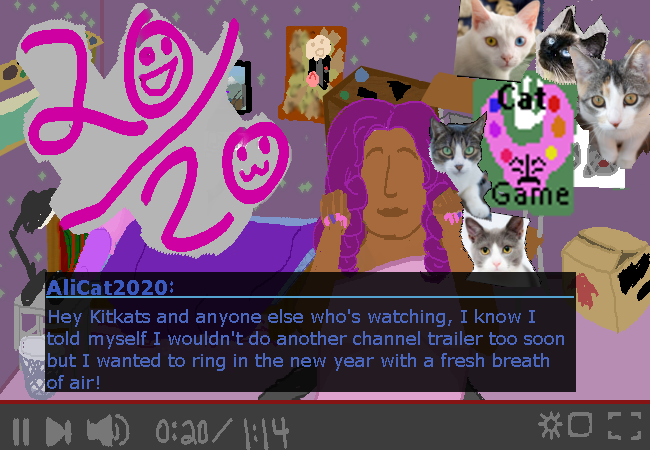 For those who are just finding my channel my name is Aliyah, and the username's AliCat2020, because what you see is what you get (+cats are the best :3). Kitkats and everyone else I have news! In the past you've played as brave crews boldly venturing to Fortuna, some causing tragedies or wars across the universe, and some causing the end of entire civilizations. You've defended the last stand, protected planets, and still done so much more. 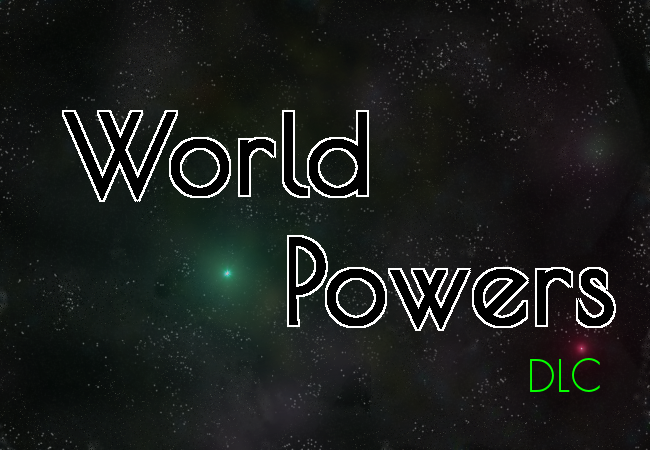 World Powers is a dlc that will overhaul the game to allow you to run not just a fledgling colony or a fortuna crew, but an entire civilization. The same deep character arcs, interactions, and long term stories will take place as you navigate the universe with an entire group of people by your side. Reach new heights, or become just another abandoned world the next fortuna crew will visit. Every action has added stakes as how a character arc ends determines once more how they affect those around them, and in a position of power this goes down to the people of your civ too. 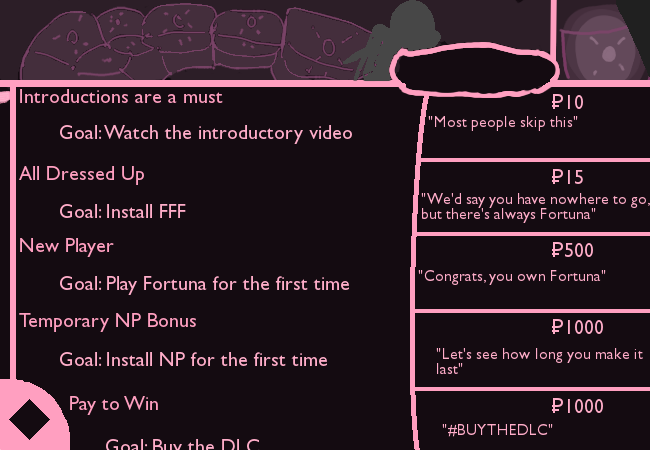 We're also including a number of new species that each affect the gameplay we've mentioned so far, and given the coming sneak peaks your favorite streamers will get there'll be a free Streaming Mode DLC that will get out the features we've heard the fans requesting for a while now. Stay tuned for further updates here, and add World Powers to your wishlist! Thank to everyone who's voted in the google form. 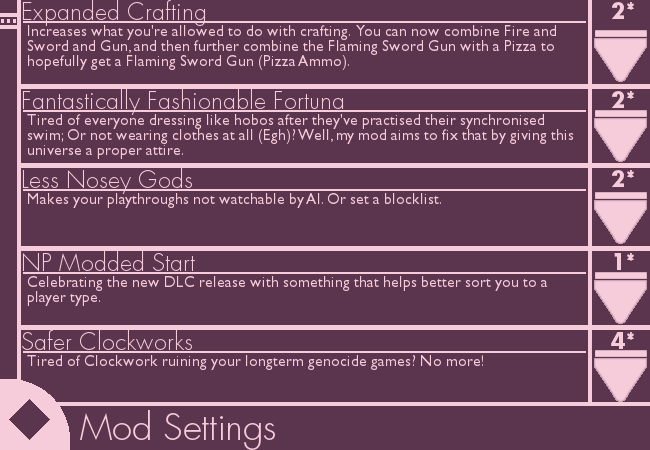 It'll be closing in the next week as I prepare to make the actual first update and allow stuff like commands. 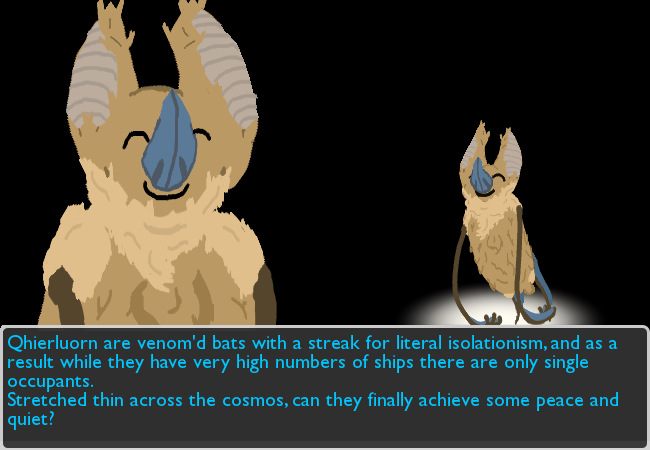 In addition there are at the time of this post 6 new species for this adventure. 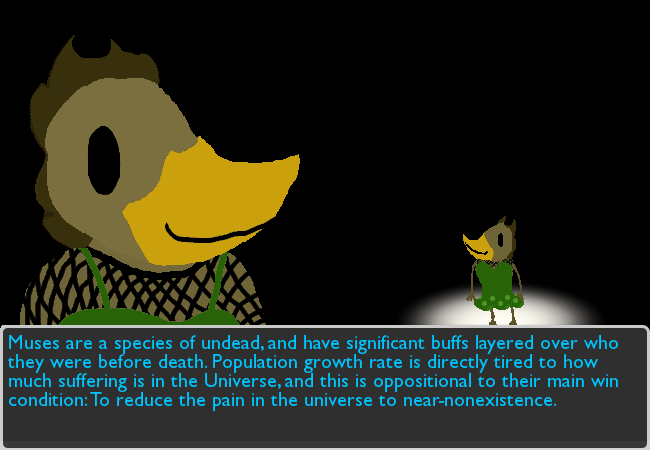 I may add more later, but general idea is that every species added in this fanon is linked to the DLC a la "their civilization does x well" stuff. 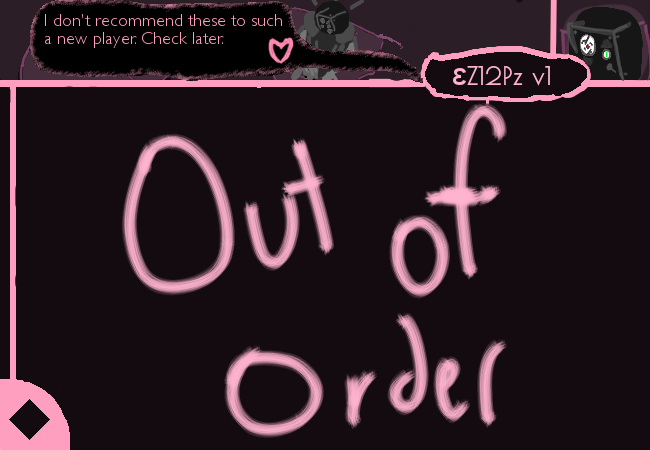 Revised Right Click has been removed from the running due to realizing it'll be more complexity and art for me to work with, and it helps to put limits like that. Shrugalug here. Anyhow it only took 4 votes to be considered In, but it was raised to 6 as we started getting more responses. This one was trickier. 5 was considered the threshhold, but these are also serious balance breakers. Perfect Hybrids and Rewind are at 8 and 5 respectively. Perfect Hybrids is likely to be included, and along with it Safe Clockworks will also get a slight nerf in writing. They'll break balance, but not as much as they could, since we got three of these. Turns out when you give only one option selectable people divide themselves. Ties do count as a win for this one. End result of this one being that Egyptian is p much a for sure thing. If we still have a tie I'll do a coin toss. None Results (vanilla game) was considered to be in competition with the amount of votes for other pantheons. 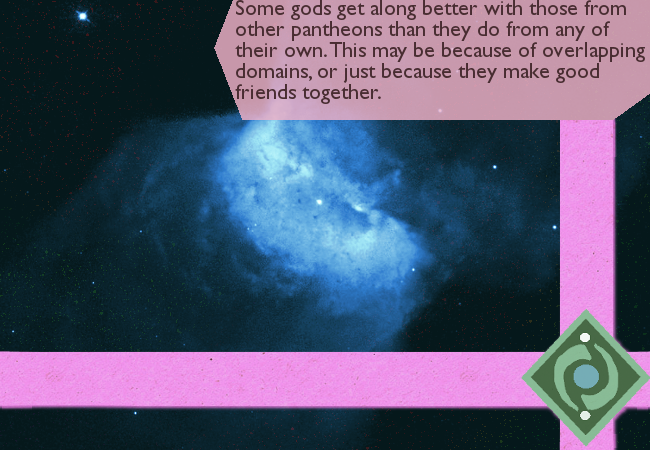 Meaning since there were more than 6 votes for non-greek/roman, pure vanilla pantheons is out of the running. If you read this section and haven't voted yet, please do. Just select two mythological pantheons. 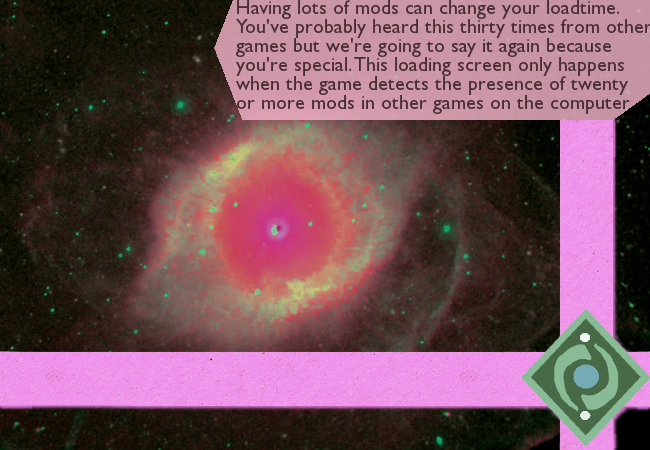 If it's not a real world pantheon or a part of the fortuna canon (holidays are an example), please put it in the mods section. Don't worry if your fav pantheon doesn't show up, I have plans to open it back up later. This section is a bigger spoiler. You'll find out next update. 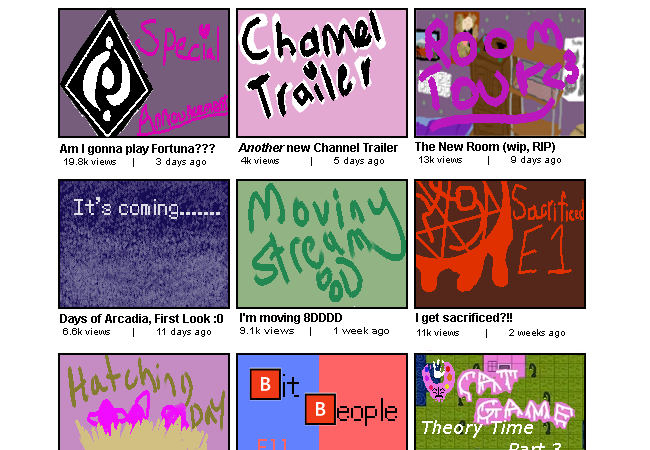 Looks like the stream has already started. Who should we add to the blocklist? Then there's the dominant pantheon..
Alicat2020 will need to know what god or gods to put on the blocklist, and in addition a pantheon needs to be picked as the universe's dominant pantheon. Available are the Roman, Egyptian, Norse, Vocaloid (JP), Vocaloid (ENG), and Utau (Worldwide) pantheons. This will affect the universe at large, and may shake up some parts of it, but otherwise just determines who is running god meetings and is in charge of game functions. These will add to the list of options available in the next update. 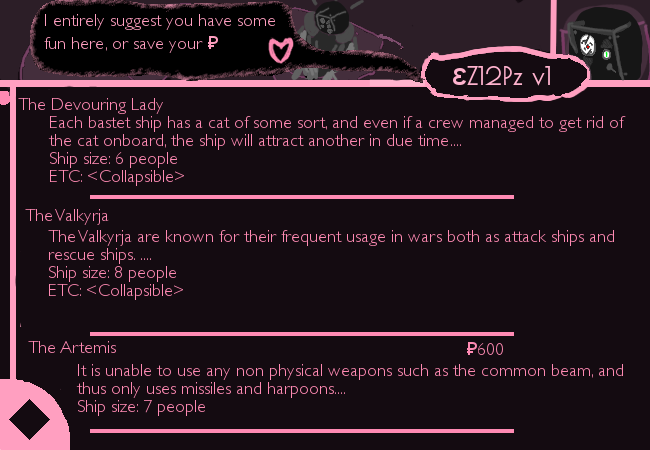 Perhaps Coeus for some Ship/Ai/Patron options? >Block: All except Hermes. If they want to know what we're doing they have to use the messenger. (02-27-2018, 04:02 AM)SirBlizz98 Wrote: » >Block: All except Hermes. If they want to know what we're doing they have to use the messenger. >Block Hephaestust, he may be nice but he's SUCH A FUDDY DUDDY EUGH. Pronouns: He/him or they them? >yes, block everyone but Hermes. 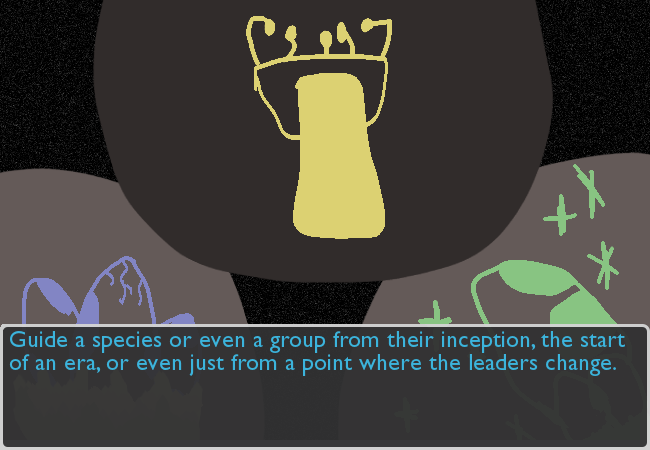 >Dominant Patheon : vocaloid ( Japan ), let's wreck the world like a bowling ball. > give! Us! Donations! Rewards! Duck, duck, duck, duck, GHOOST. > Gumi for a Patron Option!! 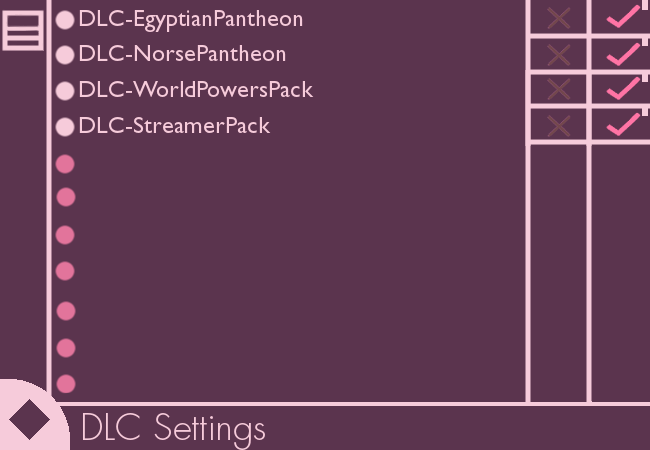 AliCat2020 sets the Vocaloid (JP) Pantheon to full dominance with a higher spawn rate for norse, egyptian, and english vocaloids. The universe already feels to be changing. Because of AliCat2020's opinion on Hermes the chat's mention causes him to be the first block. She then follows this with blocking Hecate, Mors, Hel, Hephaestus, and Thanatos. "We'd say you have nowhere to go, but there's always Fortuna"
"Let's see how long you make it last." Goal: Install NP for the first time. "Hailing from The West, they're here to slay all day and dance all night"
"Furries can do infinite crime"
Goal: Have a character wear a fursuit, commit a crime, and get away with it. 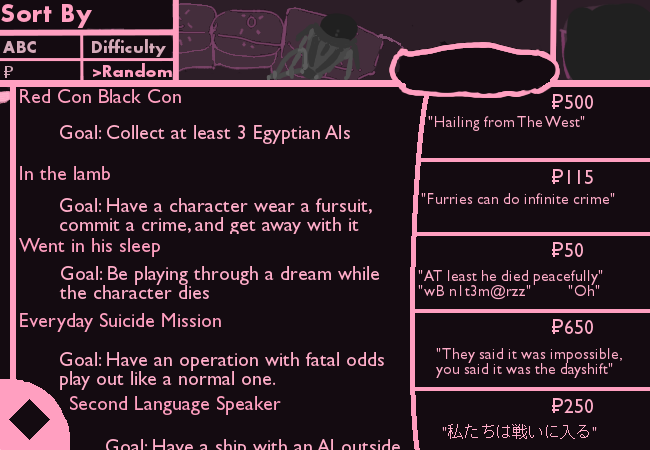 "At least he died peacefully" "wB n1t3m@rzz" "Oh"
"They said it was impossible, you said it was just the dayshift"
Goal: Have an operation with fatal odds play out like a normal one. Goal: Have a ship with an AI outside of it's pantheon. "It's a serious war to some people"
Goal: Have one character gain romantic points from two or more characters. Goal: Unlock another skin for an AI..
"Do it for the achievement!" "Hmmm I think I'll have the Flying Dutchman"
Goal: Manage to discover and order off a shopkeeper's secret menu. "There's no yo dawg meme here. Sorry." Goal: Purchase a ship during a run, and sell it for at least double what you bought it for before reaching Fortuna. Goal: Stop a war. This achievement does not apply if you kill everyone, or most of the people involved in the war. The peace must not come due to fear. Strange things happen in the universe, and with this you’ll run across more strange, if sometimes disturbing events. 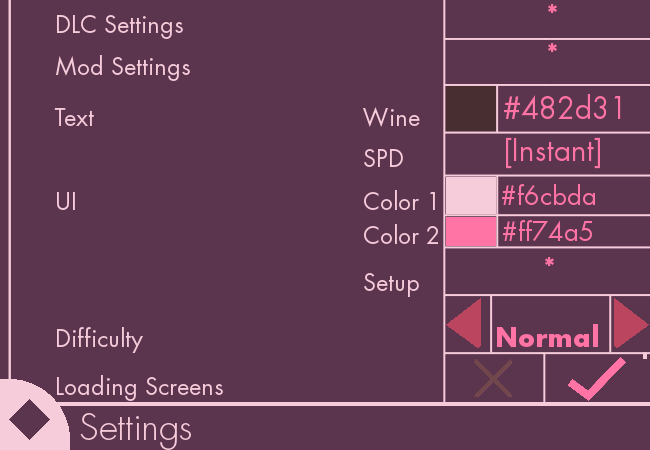 Can be toggled off. After buying this you are able to input a keyword. Things relating to this keyword are more likely to pop up. Can be toggled off. Be able to pick one item for each character you make to start with within reason. The rest of their items are randomized or picked using their traits as a guideline. Can be toggled off. 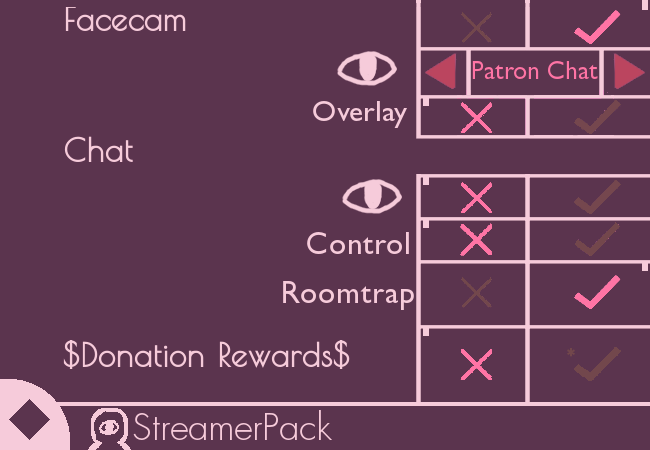 Allows you to have 2 patrons at once. Can be toggled off. Allows you to start with a Fortuna item brought from the Fortuna item section of the store. Up to 3 slots can be brought. Can be toggled off. Be able to start with two ships but only a crew size as big as the smaller ship. Be able to start with a ship of one god but the AI of another god. Gain access to level 2 bonuses for gameplay bonuses. 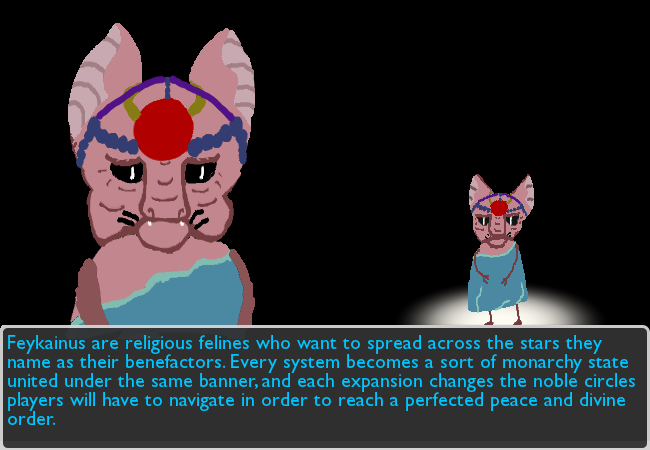 Each bastet ship has a cat of some sort, and even if a crew managed to get rid of the cat onboard, the ship will attract another in due time. sometimes tales are told of the cat onboard the ship turning into a ferocious beast and slaying a threat. Otherwise they are typically found with strong distress beacons and are easy to install new weapons onto. The Valkyrja are known for their frequent usage in wars both as attack ships and rescue ships. It's considered an offense punishable by death in most sectors to outfit your ship as a rescue vessel when it is being used to scavenge or otherwise incite furthered violence. They are known for having good signal detection and easily upgradeable shields. 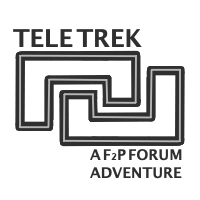 Like any species based ships they are known for being rather bland if at all able to reach the speeds necessary to traverse wormholes, in addition to their low crew and carrying capacity. They're most commonly used by small nomadic families in packs, or poor space truckers. 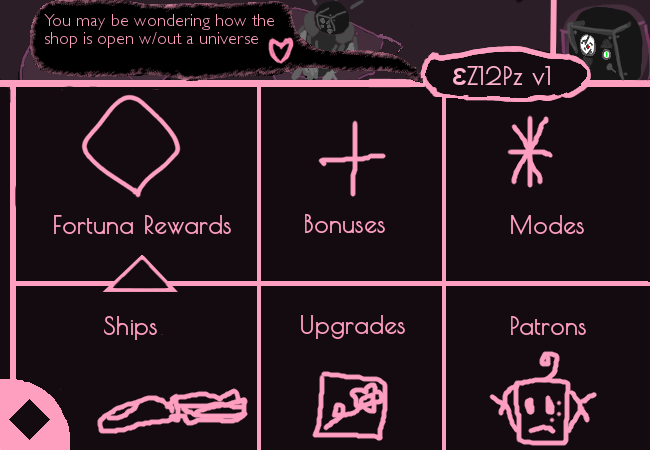 All 'species' ships will become unlocked permanently once purchased, with your achievement points refilled next run. It is unable to use any non physical weapons such as the common beam, and thus only uses missiles and harpoons, meaning that ammo count is highly important. 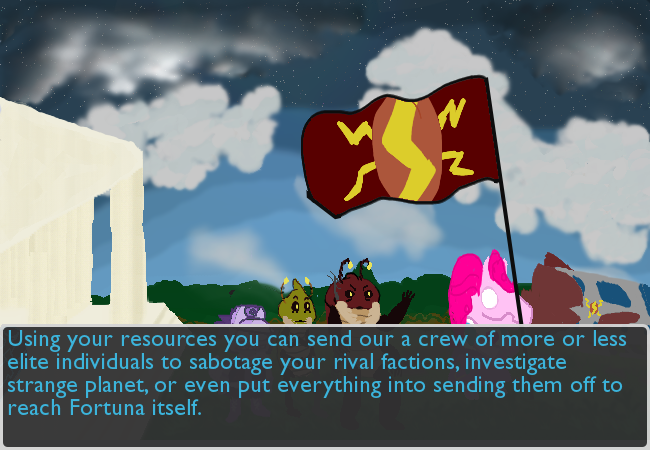 Like all elemental ships, flourine ships are able to source fuel from elemental deposits, and detect it. Aside from that they're unremarkable save for when the rarer Flourite Octet model is seen. The Hathor ship is frequently referred to as a mobile nightclub. Crew on Hathor Ships are regarded with a mixture of respect and adoration in hopes that a famous party will be hosted by the landing crew. These ships are rarely seen landing planetside as they all come with sophisticated crew/item teleporters. Some say this causes more problems than it solves, but most of the people saying that are engineers responsible for managing the scrap stocks. The 7 of Swords is rarely seen at all due to the fact that they are often in disguise as another ship entirely, but is also known for the fact that the disguise can easily slip if things aren't kept in check. These ships are typically considered to be one crewed by those with great courage and determination similar to The Chariot, but unlike it it is considered to be the strength within that empowers crews to move boldly forth. This ship is known for it's uncanny resemblence to what is believed to be a severed human head. Most will either be hiding heavy armaments by that scary appearance, or will rely on the moving pupils of the ships 'eyes' to scare off pirates. The Vili is known for it's remarkable defenses, the accuracy of it's launchable guided axehead, but most importantly the wills the crews hold. Did You Know: Upgrade slots scale in price over time. Your first one is cheap. 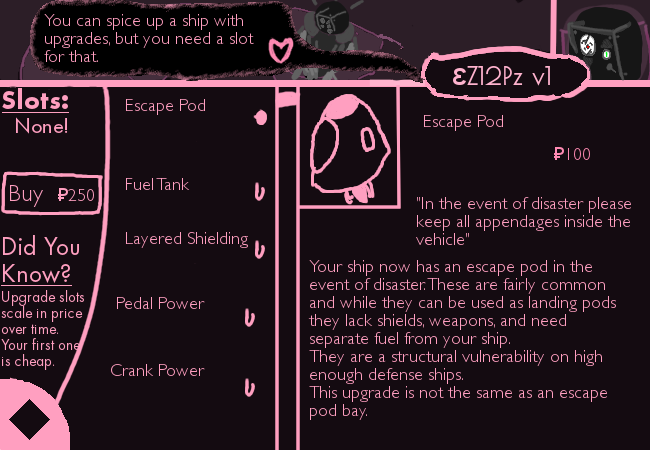 "In the event of disaster please keep all appendages inside the vehicle"
Adds an escape pod to your ship. It can contain about three average sized people and enough fuel and rations to get safely to a nearby planet. Takes up a notable amount of space in an onboard room and needs it's own fuel. "Make sure to fill it up before you get back"
Adds 100% more capacity to your average sized ship. Likely to take up a full room or more. "Good luck I'm behind seven shields!" For every shield star the ship has a weak layer of shield to defend itself with. Shield arrangement is customizable. Not a good choice on glass cannon ships. "Like a spin class, but you can't leave until you finish"
Your ship gains two bicycles that can derive power from agility based work points. 10 fuel per work point. Crew working the pedals can't do much else. "Like a flashlight but you can't fly until you pump some iron"
Your ship gains two crank machines that can derive power from strength based work points. 10 fuel per work point. Crew working the pedals can't do much else. She serves Ra as one of his eyes. Divine justice and vengeance are two things she excels in despite how others call her goddess of love or homes. She is the egyptian god that has been rolled as your free patron. + In combat she will bear down on her enemy until they are destroyed, and she may summon her arrows, six other gods who will assist her in these endeavors. + Those trying to steal or break into the ship will have a very unfortunate time in their attempt. + Like most egyptians she will gladly accept gifts, and will also guide those she is patron of. - Not all patrons are so fond of her firey reputation. - Lying to her or acting out wrongs are a quick way to earn her scorn. The valkyries are known for exalting the souls of those who died honorably in battle to Valhalla, where they become part of the Einherjar and prepare for Ragnarok or drink mead served by the valkyries. As such she starchly supports honor and facing problems head-on. + A good match with most norse patron choices, and using her will typically lead to unlocking Einherjar v1. - Those who die in combat while she is patron will not be usable as heroes in subsequent games, or be spawned in subsequent universes. 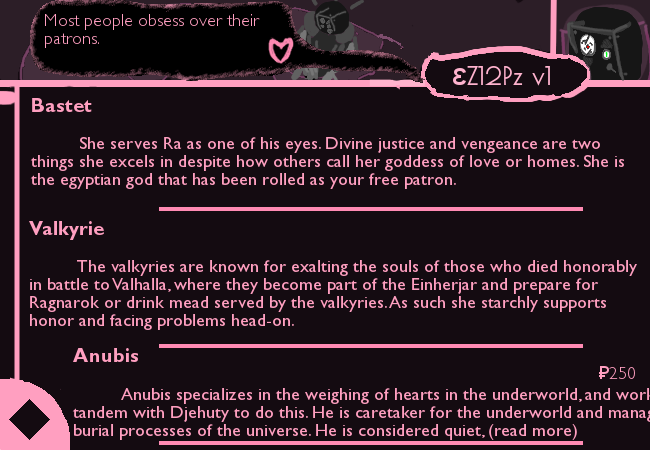 Anubis specializes in the weighing of hearts in the underworld, and works in tandem with Djehuty to do this. He is caretaker for the underworld and manages burial processes of the universe. He is considered quiet, but also hard to anger and agreeable. + In the event that something considered supernatural is a threat to your crew, he will tell you how best to avert disaster. + Once per game a death will be easy for the crew to accept, and move along with. The body will be recovered and buryable. In rare cases he may be asked for another of this. + Do give him headpats. It's ok if he doesn't smile, that's normal. - He will leave and never come back if you desecrate the dead, along with other actions. - Anubis isn't likely to object to your decisions when he really should. - Don't confuse him for Wepwawet, or any of the other jackal headed gods. He won't get mad, but he will get sad. Initially unpopular and considered unremarkable Kaito eventually achieved popularity with any and all fans of vocaloid. Good audio quality, inoffensive, and part of the family. + Kaito suffers less from song overuse. Selene is responsible for keeping track of moons, and is the most powerful moon god in the greek pantheon. She's typically agreeable and hard to upset. Ratatoskr is the squirrel that climbs the world tree to deliver the messages between Vedrlfolnir and Nidhogg, but not one to know when is good enough he's easily expanded his horizons as the universe's gossip mill. Initially considered lackluster similar to Kaito (but not to the extent of failure), she eventually not only came into her own but manages to year after year hold her own with the others regardless of what she performs or embellishes. - GUMI is vulnerable to both overusage and burnout, but mostly the former. Aset is a goddess centered around her heka, motherhood that led to Heru-sa-Aset on the throne, and her marriage to Osiris. She's considered honorable by her pantheon. + Aset drops helpful hints as to what actions will steer your captain to greatness. Despite being Vanir, she is considered to have earned her place among the Aesir. Known for her skills as a Seidr in addition to her passions in the hearth, she will grant your crews a rare gift. She is also known for selecting among the dead who will join her heavenly field, Folkvangr. + Freya will give you the choice of bestowing a crewmember [Visions] or a [Destiny]. She may hear out a request for another trait, but it will always be purple. + While not a god of knowledge she does have something else on her side. 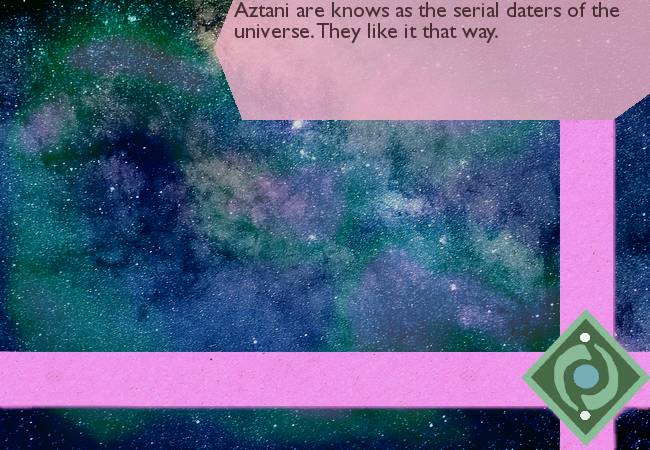 + Freya will allow you to rewrite the epilogues of a single crewmember, but may allow more if you make an exchange. - She frequently enjoys gifts, and without them you may earn her ire while she is patron. - Some may roomtrap you with dreams to take her as their wife, though more likely is she to leave you in search of her husband, Odr. - Those who die in combat while she is patron will not be usable as heroes in subsequent games, or be spawned in subsequent universes. Arguments between her and Valkyrie may ensue. Idunn takes care of the apples of youth that keep the norse v1's through 9's healthy and stable. Friendly to a fault, she's often found herself wrapped up in less than desirable situations. + Your crew starts with an apple that when eaten will grant a long healthy life. Sharing it can reduce the benefits. The leader of the vocaloid pantheon is well known for her killer drive, and that she is not afraid to make heads roll. The face of the vocaloid pantheon is well known throughout the universe, and is happy to be your newest friend. At the right price of course. + [Diva]'s can be a lifesaver when you need them. - [Diva]'s can be the last thing you want to deal with. - She ranks high on vulnerability to overuse. 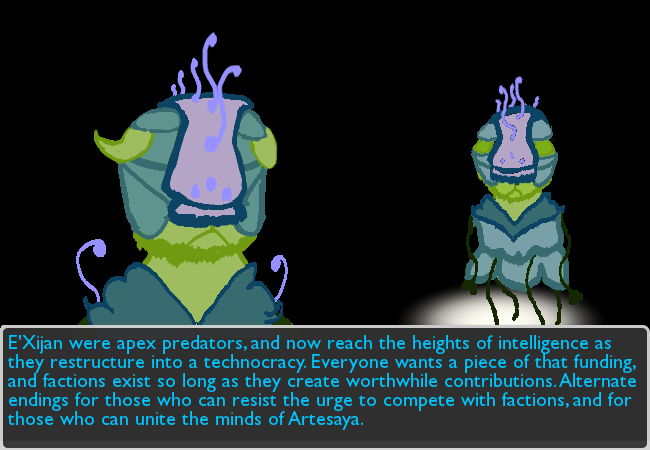 Coeus is a knowledge god with a passion for quests and riddles, though he is almost always forgotten by others. This has caused him to frequently resent others for brief periods before letting go of the matter. As such not all patrons enjoy this. + Coeus isn't hard to get along with if you can understand why he behaves the way he does. 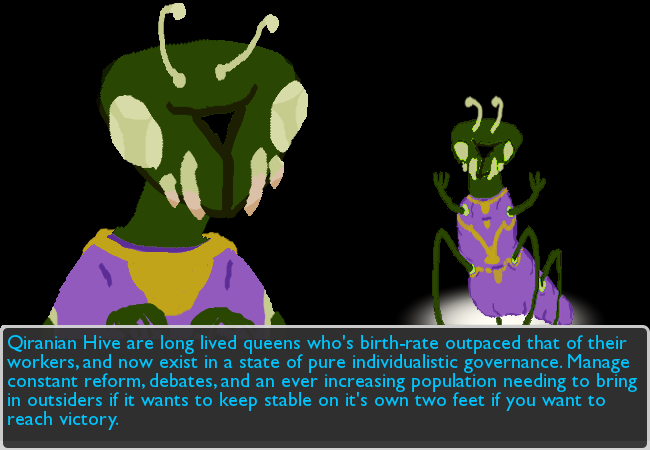 - Coeus will auto-complete quests how he wants to until the player has reached high enough friendship with him, and uses a coin flip most of the time. Even at high friendship rewards will likely be downgraded. - Unlike most knowledge gods Coeus will cryptically hint at whatever has been asked of him, or will give a riddle. - His patron fee is prohibitively high due to his imprisonment in the underworld. Sobek is a typically passive god that will combat those who would do the dead harm, and takes care of repairing the files of Duat. Some consider him lazy, but lying in wait is his way. + Once per planet Sobek will grant a bonus of STR, END, or AGI to one character of your choosing. This lasts for the rest of the planet. + Near the end of each game he will offer you the choice between your best weapon being guaranteed for a future crew, or having all future crews start with an upgraded version of your weakest weapon. - Sobek should not be trifled with. Until you prove yourself his patron fee will remain high. - He may not make his feelings clear, as the lord of the nile is quiet until it is time for action, or action with words. - He will throw a test at you anytime he sees you as ready. In order to use Loki you must one of a number of achievements relating to him. Loki offers disguises and similar mirthful options while being your patron, and will not stand in the way of your choices so long as he is able to have his fun. In order to use Ra you must have first unlocked him by being deemed worthy by one of his eyes, or by smiting a manifestation of ap/ep. What Ra offers is the awareness of laws, righteous acts, and a number of other boons. He will leave immediately if certain choices are made. In order to select Set you must have survived a high danger planet on hard mode, or have willingly weathered a heavy storm with your crew. 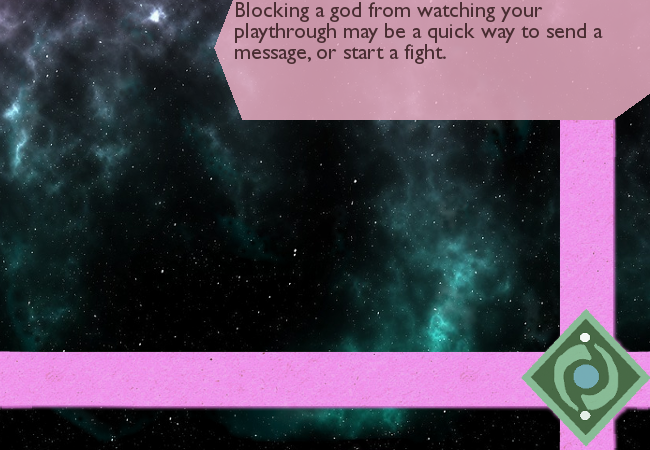 Set as a patron is known to both challenge people to see beyond barriers, but that he will frequently create barriers for his player to overcome. He will leave instatnly if you do not smite ap/ep. Suggestion: Lets go a bit unexpected here. Get wild universe, Coeus ship, and pay Sobek's fee. Either that or go for Coeus patron, puzzles can be fun! > Anubis, we need to give him pats. 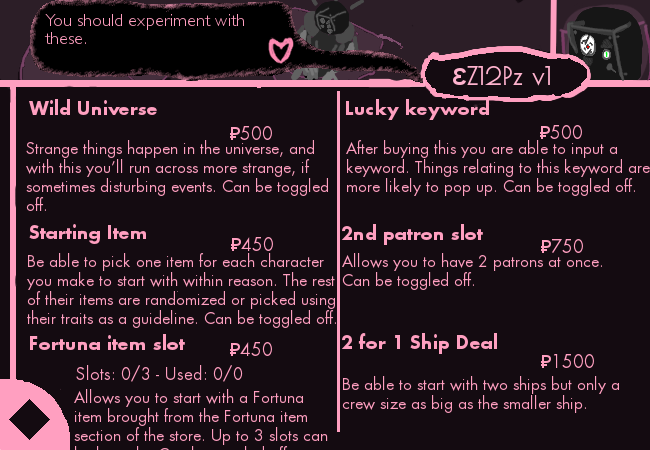 >Let's not pick starting item/Lucky Keyword rn because we need a few points for patrons! You're not going to regret it, the first run is always good for achivements. >If you want a upgrade slot, pick Crank! Is cheap and easy to use. >THE MIKU SHIP IS TOO GOOD TO PASS UP. >Miku Ship allllll the way. 150p remains ; AliCat2020 will swap to Starting Item if The Ole Switcheroo is not used. This is a bump! I want the next page to start clean. Update should once again be done by monday, which is a nice groove I'm settling into as I get better at this. Current time: 04-25-2019, 03:53 PM Powered By MyBB, © 2002-2019 MyBB Group.